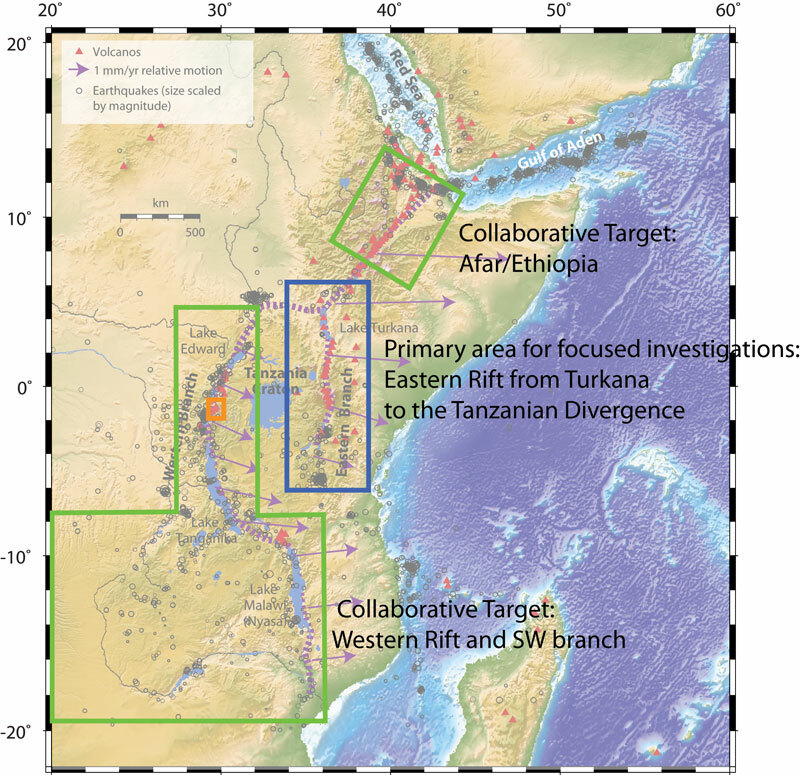 The East African Rift System (EARS) exhibits a wide varitey of rift processes and characteristics, making it an ideal target for GeoPRISMS goals. Aspects of all the four key rift initiation and evolution (RIE) questions defined in the GeoPRISMS Science Plan can be addressed in part or entirely in this primary site, given the great variety of rift processes and characteristics expressed in this setting. It presents a young, currently-rifting system that expresses the entire history of a continental rift evolution – from initial border faulting in the south to seafloor spreading in the north. The complementary subaerial and lacustrine settings through the EARS present a distinctive mix of environments for the amphibious nature of the GeoPRISMS Program. What factors control the distribution and ponding of magmas and volatiles, and how are they related to the extensional fault systems bounding the rift? How does the presence or absence of an upper-mantle plume influence extension? How does the mechanical heterogeneity of the continental lithosphere influence rift initiation, morphology, and evolution? How is strain accommodated and partitioned throughout the lithosphere and what are the controls on strain localization and migration? How does rift topography, on either the continental- or basin-scale, influence regional climate and what are the associated feedback processes? Further information about these topics, a summary of existing datasets, and critical research efforts for GeoPRISMS studies can be found in Section 3.2 of the GeoPRISMS Implementation Plan. The Implementation Plan for the East African Rift System has been updated following the outcomes of the workshop, and is available for download.